The Advisory Committee on Social Witness Policy has sent a resolution (Item 11-14) for commissioner approval to the Presbyterian Church (USA) 222nd General Assembly meeting in Portland, Oregon June 18-25, 2016. The resolution includes a pastoral guidebook, a statement of affirmation, and recommendations for conversation and advocacy. It’s long—49 pages—but the subject is critically important for human lives and so it what the church says about life at its end matters, just as what the church says about life in the womb is of critical importance. So, I am taking a literal and figurative big breath and plunging into a blog series to analyze this piece of business coming to the PCUSA with both potential and pitfall. Here is my working outline for a seven-part series I am calling “End of Life pastoral guidebook holds potential and pitfall.” Part one begins below the outline. In the Presbyterian Church (USA), a 1.6 million member (2014) denomination with an aging demographic, there is a growing need for pastoral care at the end of life. In a culture where the number of states that have legalized physician assisted suicide (PAS) is growing, it is appropriate that to produce a “pastoral and educational booklet” giving guidance for decision-making at the end of life in response to a 2014 General Assembly action. Specifying a team of 7-8 made up of “ethicists and physicians,” the original proposal from Synod of the Covenant was amended, adding theologians and pastors to the writing group, and approved. A broad range of topics to be addressed was included: physician-assisted suicide (PAS); palliative and terminal sedation; the role of medical professionals and pastoral support; the special circumstances of dying children and the dying pregnant woman, the chronically ill and severely disabled persons; organ donation; faithful conversation about end-of-life planning and advance directives; and support for the faithful exercise of Christian conscience on these matters. The resolution presented for approval to the 222nd GA in Portland Oregon in June contains the requested pastoral guidebook as its rationale. Four recommendations accompany the resource. Together they comprise a very comprehensive approach to encouraging conversation, education, and advocacy focused on individual development of advance directives for end of life treatment and care. If implemented in a biblically faithful context there is great potential for this resource to be a helpful to individuals making decisions at the end of life for themselves and loved ones and also to those engaged in pastoral care. There are some pitfalls—I’ll get to those as this blog series progresses. Recommendation 1 is a standard call to “approve the pastoral guidebook titled, “Abiding Presence: Living Faithfully in End-of-Life Decisions,” as a “theologically and ethically grounded resource for pastoral care.” It specifies that the resource be made available through both electronic and print means. The guidebook and its appendices are 45 pages long and will be considered by the GA Committee on Social Justice Issues as item 11-14. I’ll focus on the guidebook in Parts 2-6 of this series. The second recommendation asks the Assembly to “approve the affirmation and recommendations following for Christian public witness in support of the advance care planning, healthcare access, and respect for personal conscience described in the guidebook.” Take notice of the broad reach of that recommendation! At first reading, one might think it only asks for confirmation of the statement: “Affirmation: Faithful Living at the End-of-Life” (which actually resides in recommendation 3). Commissioners approving recommendation two will also have affirmed advocacy of advance care planning, healthcare access, and respect for personal conscience. Those who have followed the advocacy of the PCUSA for very long understand that such a broad statement could take us to supporting things which do not hold with our convictions that every life is valuable from fertilization and for every day that God gives life until natural death. Respect for personal conscience sounds positive unless it leads to advocacy for legalization of physician assisted suicide at some point in the future—and it very well might do exactly that given the liberal, leftist, make up of advocacy groups in the PCUSA! Commissioners should also take note of the words, “and recommendations following.” There is a pitfall here if anyone took a mind to be subversive. Approving recommendation two could be interpreted to include approval of recommendations 3 & 4 (with its seven subpoints). I could not help but remember as I read this recommendation the perverted process used in to approve the 1992 abortion policy document. The first few recommendations were approved subpoint by subpoint in a long drawn out process, then all the rest of the document was suddenly moved as a unit. Most commissioners did not realize what they were voting on in that moment and many understood too late that they had approved language they did not intend to endorse. It is sad to be skeptical of fellow members in one’s denomination—but history shows, it is prudent to ask questions and be very clear about what you are approving. When in doubt, move to amend the language until it is clear. Recommendation 3, encourages “Presbyterian medical personnel, caregivers, pastors, deacons, and other providers of end-of-life treatment, care, and support to lead studies and discussions of these resources…” for the purpose of strengthening “the understanding and use of advance directives.” The Affirmation statement itself follows the encouragement to conversation and certainly provides a springboard for discussion. One needs to keep in mind, however, that because of the wording of recommendation #2, the Affirmation is not only a statement to launch discussion, but the foundation for ongoing advocacy efforts of the PC(USA) Office of Public Witness in Washington D.C. and the Presbyterian Ministry at theUnited Nations and other advocacy and advisory committees of the PCUSA. 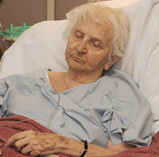 The affirmation titled “Affirmation: Faithful Living at the End-of-Life” begins by stating, “God’s good gift of life does not come without God’s guidance, guidance carried in the Scriptures of Old and New Testaments and interpreted in our confessions of faith.” It lifts up the advances in medical science that have prolonged life and reduced pain and affirms God’s “abiding presence” which accompanies this process. I would have preferred it reference God as ‘Creator’ of life, rather than its ‘cosmic Giver’ and I believe scripture teaches that God views human beings as more than “part of the web of creation” (whatever that might mean)—but perhaps I’m just being word-picky. Death is described as a “purposeful journey” and the completion of our baptisms. While the suffering that often accompanies death and the frailty of our human bodies is readily acknowledged, so is the power of resurrection that empowers us even in grief to respond with hope. One paragraph in the affirmation especially gives me pause. The language is reminiscent of sections of the abortion policy document that permit—even condone—a woman’s choice to abort her child. “Decisions to hasten death may be understandable as a last resort” rings with the warning reminder of how quickly, “Abortion ought to be an option of last resort” became abortions covered in the Board of Pensions Medical Benefits Plan. Will decisions to hasten death—deep sedation, physician assisted suicide—also become covered under the medical benefits we provide for our pastors and their families? Recommendation 4, calls for support for persons facing end-of-life decisions in seven sub-points. It encourages all PCUSA members and friends to develop end-of-life directives, living wills or POLSTS; affirms doctor patient discussions, affirms judicial and legislative presidents that protect rights to refuse treatment, hydration and nutrition; recognizes diversity among Presbyterians regarding physician assisted suicide and calls for regulations that protect the vulnerable; supports study of PAS; encourages organ donation as a gracious gift, and encourages careful planning of funerals. Lots of potential and plentiful room for pitfalls. Commissioners, Please proceed with prayer, care, and caution! All comments are reviewed before they post. Can we see the ugly truth about Planned Parenthood’s promotion of abortion while we are blinded by the log in our own eyes—the payment of abortions through the Board of Pensions Medical Benefits Plan? Planned Parenthood has reported a record year for abortions, according to CBN News. Pro-life Presbyterians should protest, but is there a more effective response? “A rally in support of abortion giant Planned Parenthood took place inside a Presbyterian Church in Louisiana last month,” reports Carole Novielli of LifeNews.com. “Planned Parenthood Gulf Coast organized the “Stand with Women” rally in support of a new abortion facility in Crescent City. 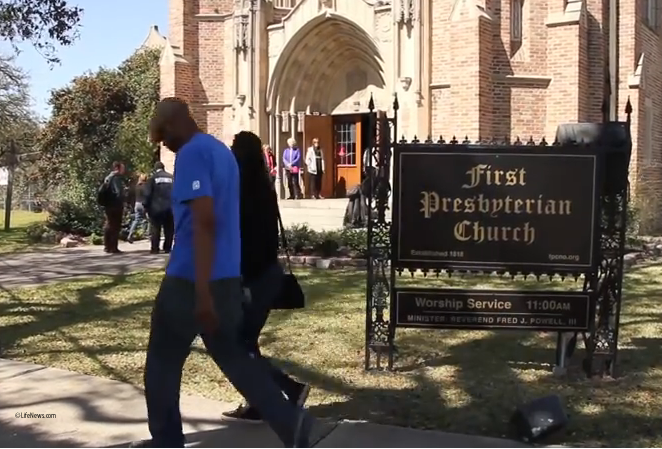 The rally took place at the First Presbyterian Church of New Orleans affiliated with the PC(USA). Rev. Fred J. Powell, III is the church pastor.” Novielli’s article includes this link to video of the rally. Rally speakers present a familiar well-scripted message intimating that Planned Parenthood cares about women’s health, women’s bodies, and women’s rights, and “reproductive justice”—especially the “full spectrum” of reproductive justice. What they don’t say but what “full spectrum of reproductive justice” really means is abortion. I am not a pastor, but I found this part of the paper to be educational and helpful. I found little to criticise so will summarize with few words of response (italics). Section B of the End of Life Pastor’s Guide explores two key questions pastors may have about their role in supporting congregation members making end of life decisions in the healthcare environment. The first question posed for pastors is: “What does it mean to live faithfully and die well, and how can I contribute to this task as a spiritual leader?” At the end of Part II in this blog series I complained that I had yet to find the distinctive voice of the Christian church—that hope of eternal life we hold even as our physical lives end. I am so glad I continued reading because I did find that hope expressed in this part of the paper. Here is my attempt at a summary.